The world of Google is very, very big. Google says that the web now has 30 trillion unique individual pages, which is up an astounding 30 times in 5 years. With all of this noise, it is vital to make your voice heard so that your potential clients can find you and not your competition. This is precisely what SEO, or Search Engine Optimization, is about. 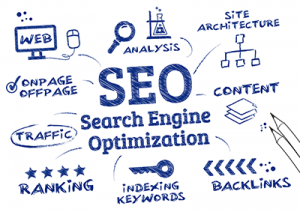 In this article, we will review SEO, what it entails and the benefits of investing in it. In it’s simplest terms, SEO is optimizing the content on a website and generating activity off of a website so that search engines can find it and give it a favorable ranking. SEO can be broken down into three categories: Onsite SEO, Offsite SEO and Quality Content Development. Onsite SEO consists of all measures taken on a website to make it a more attractive choice for a high ranking for the search engines. Google has over 200 criteria that it uses to determine whether or not a website should warrant a higher ranking. At Bush Marketing, our team has expertise in all three facets of SEO. Offsite SEO is that act of generating a high number of inbound links to your website from respected or high ranking websites on the web. The more activity Google sees about your website on the internet, particularly in popular and well-respected sites, the higher it will rank your website. Word Count. Ensure that the blog post is a minimum of 500 words, ideally 700+. Keywords. Select keywords that are essential to your post but also that you wish to rank for. Use them in a reasonable amount (about 3% of you copy or less). DO NOT STUFF. Adding too many keywords can get you penalized. Title, Link, and Description. Make sure that you are incorporating your keywords into these three areas. Mobile Friendly. Make sure that your site/blog is mobile friendly. This is vital. At Bush Marketing, we facilitate all three of these elements of SEO in our marketing strategies. We offer monthly reports emailed directly to you showing the month to month growth in the rankings and we consistently monitor and adjust our strategies generate the maximum potential for high rankings. Unlike previous SEO companies that I had dealt with, Andy was exceptionally responsive and happy to meet face-to-face. He provided me with a detailed analysis of my existing status, walked me through it, answered all questions I had, and offered many concrete suggestions on what we could do to improve my internet presence within my budget. With this SEO strategy, my site had multiple entries on the first page of Google within a matter of months, and my business has flourished as a direct result. Interested in a custom designed Search Engine Optimization strategy to help launch your business past the competition? Call Bush Marketing today!